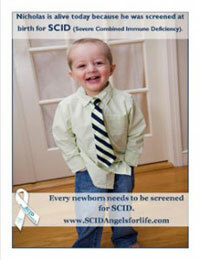 SCID Newborn Screening has made quite an impact in the news. IDF Press Release-Addition of SCID. JMF Press Release-Addition of SCID. Approval Letter from Secretary Sebelius. Letter Recommending SCID Be Added To Core Panel. Evidence Review Letter for SCID.